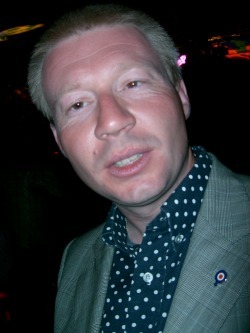 Known to many as "The Top Mod In Ponty", Andrew Knowles is a familiar figure on the rallies. Dressed in only the finest garments, his high kicks on the dance floor mesmerise the masses. Men want to be him, women want to be with him. Andrew was the driving force in revitalising the club in the 1990s, and now stands as a beacon for all young mods to aspire to. He currently rides a well-traveled PX125, and is restoring the scooter that was the mascot of the club in the early days, his faithful Vespa 150 Super - "the silver tiger". Craig is the "elder statesman" of our current active members. He is seventy-three but only admits to being late thirties. Born and bred in the valleys, Craig spent the eighties as a member of the "Aberdare Mods" and spent most of his time running away from skinheads/other mods/the police/women. The club's real ale expert, he always manages to find the strongest beer on tap and as a result spends most of his time talking absolute rubbish. His ability to clear a bar of attractive women is legendary. 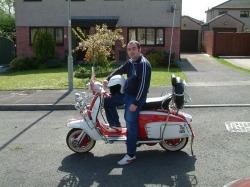 Craig rides a custom Vespa PX200 "Old Speckled Hen", owned by him since new. It has lasted considerably longer than any other posession of his carrying the Speckly name. Meirion is the club's failed stuntman. Not content with his wheelying display on an untouchables rally in Hastings, he recently spent five months in plaster after damaging ligaments and breaking his foot after a test flight outside Craigs house ended in a crash landing. The scooter was fortunately undamaged. 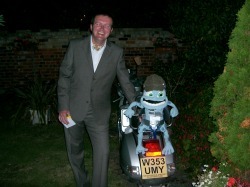 Mike is a founder member of the club, joining right at the start in 1980. His pedigree as a mod and rally going scooterist is second to none. 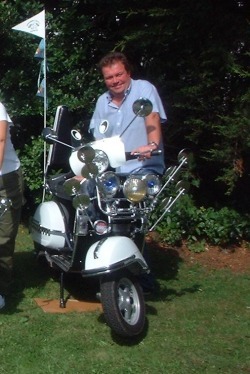 He has owned more scooters, repaired more breakdowns, and drunk more lager than the rest of the club put together. Currently touring europe with his wife Pam, his Vespa is in daily use and sees less rain in a year than ours do on a bank holiday weekend. He is the only member of the club to be able to drink his pint, standing at the bar, asleep. Not a drop spilt. We kid you not. Pam is the club chef. Before their departure for Europe, there was always a curry available in Pam and Mikes kitchen at any hour of the day and night. 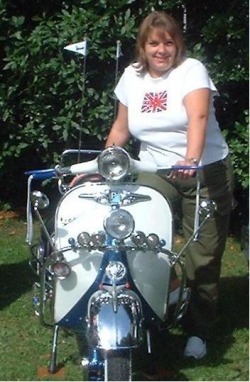 Pam is the proud owner of the Scootering Magazine featured Vespa GS160 mk1 "Reflections". It has collected awards and accolades at every rally appearance. Since leaving the UK, shares in Strongbow and Lambert & Butler have plummeted.